User-generated data, especially generated via social media, provides a useful look into the day-to-day experiences and conversations that occur around the world. This kind of data provides insights, however partial, into our hopes, our triumphs and our fears. Sometimes it reveals things that we would rather not think about, like hate speech or racially charged discourse. But in all cases, it enlightens us to what matters to people, or at least what matters to the people participating in online discussions. The past month has seen a sharp increase in two topics of discussion, the first representing an African American cultural meme from the bounce music tradition of New Orleans but more recently (and cynically) appropriated by white pop artists, and the other tied to an ongoing conflict that rapidly garnered calls for international intervention. We speak, of course, of twerking  and the ongoing civil war in Syria. While the two topics share little in common apart from recent media attention, the divergences between the space-time patterns of these geo-coded tweets show how online and offline actions and characteristics are intricately and imperfectly connected. Using DOLLY, we extracted all geocoded tweets from July 1, 2012 to September 11, 2013 from North America that referenced either "twerk*" or "syria*". It quickly became apparent that twerking is a much more popular topic on Twitter, with 775,000 geocoded tweets during this time period, while there were only 75,000 references to Syria . These numbers have changed significantly over the past month as the U.S. has called for military strikes in response to reports of chemical weapon attacks in Syria, but nevertheless there have still been three times as many references to twerking as Syria in August and September, with 133,000 tweets against just 43,000. The evolution in volume of each kind of tweet overtime is also strikingly different. Compared to the number of mentions in July 2012, twerking has steadily become a more popular topic of Twitter conversations over the course of the past thirteen months. In contrast, discussion about Syria largely declined over the course of the year, and only in August did it became a hot topic. Since July 2013, the relative amount of conversation about Syria increased almost tenfold, from an index value of 61 to an index value of 526. Though they took much different trajectories, both topics have around five times as much discussion as was the case a year ago. Looking at the geography of these tweets, just for the month of August 2013, illustrates how tweeting behavior varies across space during a time when there was a lot of national attention to both topics. Using a simple ratio of the # of Syria Tweets / # of Twerking Tweets, which we term the Twerkyria Index, the maps below show this distribution at the state and county levels. One of the most compelling results is the clear difference in ratios for Washington D.C., which has three times as many Syria tweets as twerking tweets, bucking the national average which is three to one in the opposite direction. The next closest areas are Vermont and Alaska, with relatively small African American populations, which have roughly the same number of tweets for each topic. The rest of the country is divided into red states that have more than the national average of twerking and pink states that are slightly less twerking obsessed (at least relative to attention to events in Syria). The concentration of states in the southeast -- from Texas to South Carolina -- forms a Twerking Tramp Stamp across America , with a few other concentrations tastefully tattooed across the Great Plains and Midwest. African American culture, especially as it relates to southern hip-hop. In this context, sending a tweet containing twerk is likely much more about cultural expression of local and identity politics than the more recent appropriation of the work by the dominant culture to work through "a raft of personal, socioeconomic and third-wave-feminist issues". Likewise, tweets containing Syria represent a wide range of political views and stances towards possible U.S. intervention. In short, it's complicated. 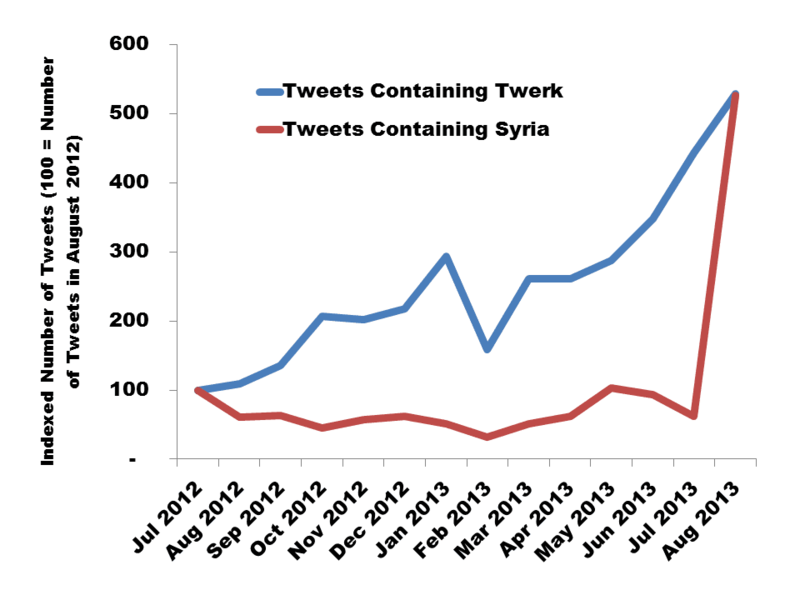 Far from a simple unitary meaning, the use of both twerking and Syria on Twitter are complicated expressions of cultural and political expression in the U.S., relating these locations both to particular regional cultures within the country and particular geopolitical configurations that span the globe. The model excludes Washington DC, given that it is a city rather than a state  and includes dummy variables for Hawaii and Alaska given their unique spatial position vis-a-vis the lower 48 states. While there are any number of ways to critique/improve upon this basic model, it works well for simple illustration . The model explains about 65% of the variation in the Twerkyria Index. States with younger populations and a higher percentage of African Americans are associated with more twerking tweets. Interest in foreign affairs is more difficult to measure (at least with standard Census data), but a combination of housing price and population density provides a measure of a state's urbanity and presumed interest in international affairs. Locations with more expensive real estate and higher population densities, i.e., more urbanized states, have relatively fewer tweets about twerking and more with Syria. This model shows that the Twerkyria Index correlates fairly well with some reasonable theoretical expectations about the nature of the offline demographics of the points of origin of these tweets. The state level, however, masks many of the subtle distinctions that emerge within these relatively large spatial units. Examining the Twerkyria index at the county level (see below) shows that the higher number of Syria tweets in Washington DC is also evident in a number of counties, roughly equal in size, to the district. While these counties are scattered across the country, a particularly large concentration is found in the San Francisco Bay with Alameda County, containing Oakland and Berkeley, representing the source of fully 8% of all Syria-related tweets. Given this large concentration, it is not surprising, that the Twerkyria Index diverges greatly from the rest of the country. In contrast, southern California largely conforms with the larger national trend of tweeting considerably more about twerking. In summary, we have no easy answer to the age old, "To twerk, or not to twerk" , but looking at the socio-spatial dimension of online activities provides useful insight on the complicated interconnections between our online and offline activities. For those few unaware of what twerking is, we refer you to the Wikipedia definition, which defines it as "a type of dancing in which the dancer, usually a woman, shakes her hips in an up-and-down bouncing motion, causing the dancer's buttocks to shake, "wobble" and "jiggle". If you still have trouble understanding it we suggest this thoughtful overview provided by the New York Times. After all, where else would one go to truly understand an artifact of twenty-century African American urban culture than the grand grey lady of journalism? Or you could view the three videos at YouTube with the most hits 1) Booty Me Down Song By Kstylis; 2) How to Twerk and 3) Jimmy Kimmel Reveals "Worst Twerk Fail EVER - Girl Catches Fire" Prank". Also the fact that no one has volunteered has been a bit of problem. But we have high hopes that we'll eventually wear Mark's resistance down. 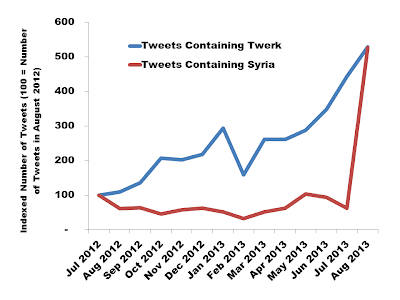 For sake of international comparison, the UK has 26,607 tweets on Syria and 28,342 tweets containing Twerk. Apparently, twerking still has room for expansion in Britian. Not to be confused with the Beer Belly of America, which is an entirely different socio-spatial phenomenon that we anthropomorphized into a regional definition. Although models that include DC actually have a higher r-squared. It just seems better to exclude it from a state level model. Seriously, this is just a blog post comparing twerking and Syria. For this, you expect peer review? Except in the case of Mark (see ) in which case the answer is yes.